When budget is the deciding factor, this low-maintenance, insulation-optional steel frame carriage house style garage door combines clean lines and classic charm to provide a popular style at a great value. Accented with decorative hardware, these doors have the appearance of a swing-out door, but operate with the convenience of automated overhead operation..
4-layer Intellicore polyurethane insulated faux wood doors resulting in 18.4 R-value. Torsion springs are standard (EZ-SET torsion springs are available on most sizes; consult factory for availability). 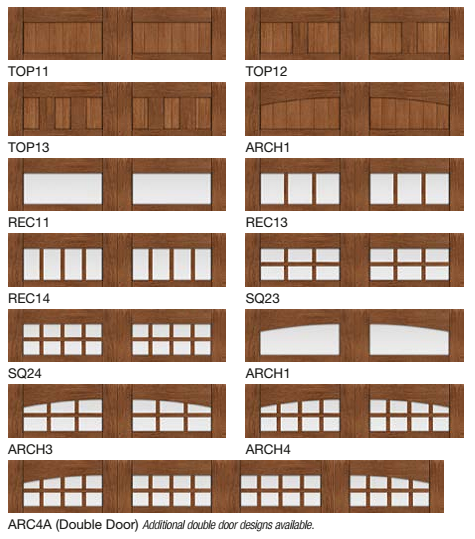 Available in 14 door designs and 13 window or top sections for multiple door design options. Custom designs also available. Base steel options include Walnut and Medium Ultra-Grain Finishes. Composite overlay available in Clear Cypress, stained to match base finish. Available from 6'2" to 20' wide in 2" increments. 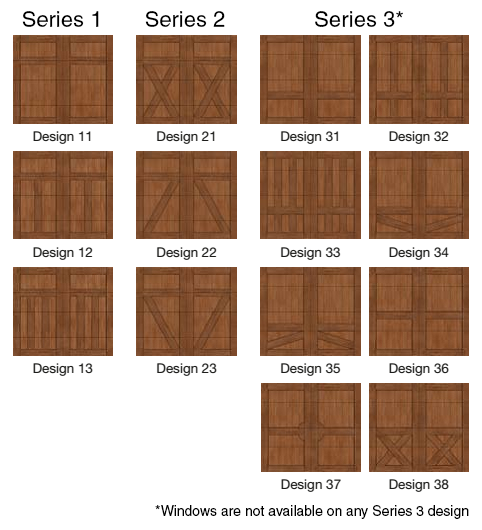 Designs 22, 23, 34, and 35 not available from 10'4" to 14'10" wide. Available from 6' to 10' high in 3" increments. 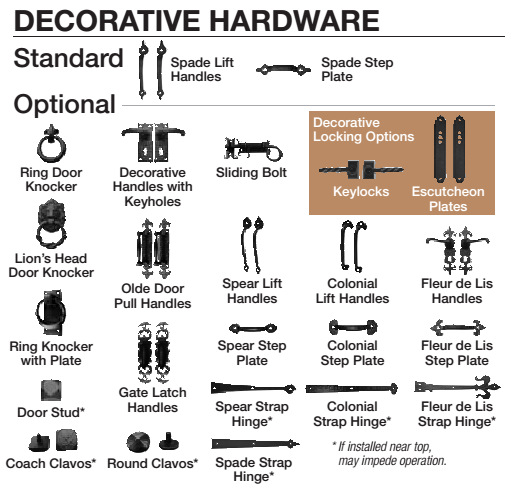 Standard decorative hardware included with the door; optional decorative hardware is also available at an additional charge. A garage door opener (minimum 1/2 HP) is recommended. 15" radius track standard. 14" of headroom is required plus 3" for a garage door opener. If you have restricted headroom, special hardware is available.